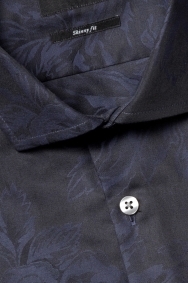 This navy Moss London shirt with its understated rose design will form the backdrop to a stylish evening outfit with personality. Crafted from 100% cotton, it’s both light and breathable, while the distinctive jacquard weave fabric helps it to stand apart from the crowd. It’s cut for a contemporary extra-slim fit that’ll provide you with a sharp profile. A pair of smart dark trousers and polished Oxford shoes will complement your look without overpowering this shirt’s tasteful pattern. Reach for a premium leather belt to round things off. 3 shirts on the deal for £60. Wash and fit well. Great quality and good fit.. 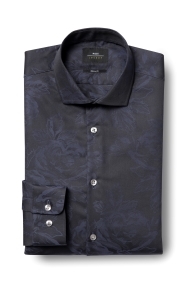 Very good shirt and trouser, worth the value of money. Good quality good price and 3 for 2.